AS a child I was used to waking up between 6 and 7am. But on one cold early winter morning of 1948, my mother woke me up at about 4:30am, gave me a bath and made my JooRa (a bun of combed and knotted hair worn by the Sikhs). After I put on new clothes, she took me to the family radio and asked me to operate it. I pushed the on-button and the light came on. Soon the sound appeared. The sign-on tune of All India Radio looked like a great achievement. Then a sweet voice announced the time 5:00am and the start of a special one hour morning service on the airwaves of All India Radio Jalandhar-Amritsar in honour of the birth anniversary of Guru Nanak. The announcer told that we are taking you to the Golden Temple Amritsar for a direct transmission of the recitation of “Asa Di Vaar”. In a split second the beat of the drums (tabla), the sound of harmonium and high pitched voices of a group of musicians could be heard. It seemed that the musicians were emotionally calling Guru Nanak to once again bless this earth with his physical presence in human form. The special recitation of the hymns of the “Guru” sounded genuinely emotional and appeared rather impressive. At that young age I did not understand as to what was being sung, nevertheless, I felt highly impressed by the melody, tone and texture of the music. I had no knowledge as to who was singing, nor did anybody announce it especially. For a number of years the voices heard on that day were shrouded in mystery, but my curiosity was always there to unravel this mystery. Several years later, I had a chance meeting in America with Sardar Jodh Singh, the retired Assistant Station Director of All India Radio Jalandhar. Sardar Jodh Singh happened to be the announcer of the programme in the sanctum sancrorum of the Golden Temple on that auspicious day. He revealed for the first time that the group of musicians performing “Shabad Kirtan of Asa Di Vaar” at the Golden Temple during the first ever live transmission on the Birth Anniversary of Guru Nanak was indeed led by Late Bhai Santa Singh, the then senior most musician of the Golden Temple. I knew it all along that it was somebody special, somebody highly accomplished. A number of “Shabads” recorded on 78 RPM gramophone records in the voices of Bhai Santa Singh Ragi and party were available in the market for decades and different stations of All India Radio including Delhi, Jalandhar, Jammu and Lucknow used to play these records. Bhai Santa Singh had the God given unique capability to sing in very high notes, which most other musicians could not replicate. His exact date of birth is not known, but according to recorded information he was born in the walled city of Amritsar in 1904. During those days very few Sikhs used to sing even in the gurdwaras and those who did sing had to hone their skills at classical music under the strict guidance of Muslim or Pandit professional classical teachers. Bhai Santa Singh was no exception, he enrolled at a very young age as a learner of Sikh classical music in the music department of the famous “Yateemkhana” (orphanage) in Amritsar. The head teacher was a renowned trainer in classical music Bhai Sain Ditta. Several of Sain Ditta’s students served as the “Huzoori Ragis” at the Golden Temple. Other famous students of Sain Ditta included Bhai Taba, Bhai Naseera, Bhai Darshan Singh Komal and Sain Ditta’s own son Bhai Desa. But Bhai Santa Singh was exceptional among them all. Soon after completing his education at the Yateemkhana Bhai Santa Singh was employed as a “Hazoori Ragi” at the Golden Temple during early twenties. His group included among others another famous personality Late Bhai Surjan Singh also. Both were bestowed with very sharp and melodious voices and could sing in unison. The democratically elected governing body for the Sikh shrines the Shiromani Gurdwara Prabandhak Committee (SGPC), replacing the old institution of “Mahanthood” took control of all the historic Sikh shrines in Punjab and North West Frontier Province in 1925, but still a very high standard of “Gurmat Sangeet” (traditional Sikh religious music) was maintained at most of its Gurdwaras at least during the first three decades of the inception of the SGPC. During those days the Golden Temple Amritsar was known for employing highly accomplished musicians for performing “Chawnkis of Shabad Kirtan” in its sanctum sanctorum. Recommendations by the influential and the powerful were never considered for recruitment of staff. Other great musicians in the service of the Golden Temple included legendry Bhai Lal, Bhai Chand, Bhai Chanan, Bhai Hira Singh etc. Soon Bhai Santa Singh carved a nitch for himself. He was very hard-working. As a first step he used to grasp the meaning of the “Shabad” to be sung. He modulated his voice to convey the true meaning of the “Shabad” without the need of explaining it through a speech or a discourse. At times he used to slow down the beat so much that the meaning of each word of the “Guru” was understood clearly even by the layman. While reciting the “Bir Rus Bani” (martial music) of the tenth master Guru Gobind Singh, he used to convey the message of war by increasing the pace of the musical composition. On special occasions, the Golden Temple and Gurdwara Janam Asthan Sri Nankana Sahib, the two most sacred Gurdwaras, used to exchange their leading musicians. Bhai Santa Singh used to go to Nankana Sahib on those occasions. All India Radio Lahore came into being in 1936, but the full fledged production facilities were added in 1937. That was the year when Bhai Santa Singh was also approved as a casual radio artist. During those days the line up of the classical vocal radio artists of All India Lahore included among others Dalip Chander Vedi, Bade Ghulam Ali Khan, Master Rattan of Phagwara, Master Madan, Dina Qawaal of Jullundur, Mubarik Ali Fateh Ali of Jullundur and Harish Chander Bali. The leading Sikh religious musicians included Bhai Santa Singh of the Golden Temple and Bhai Samund Singh of Gurdwara Janam Asthan Nankana Sahib. Malika Pukhraj, Bhai Chhaila of Patiala, Mohammad Rafi, Noorjehan, Zeenat Begum, Shamshad Begum, Dilshad Begum, Mukhtar Begum, Parkash Kaur and Surinder Kaur were considered much junior Punjabi song and “Ghazal” singers. Casual singing at All India Radio Lahore made Bhai Santa Singh very famous. During those days Genophone Recording Company opened its modern recording studio in Lahore. Master Ghulam Haider was hired as its music director. 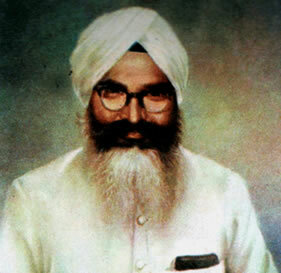 Master Ghulam Haider developed a special liking for the voice of Bhai Santa Singh. He persuaded Bhai Santa Singh to record some “Shabads”. The tunes were either traditional Sikh religious “Reets” handed down from generation to generation or Bhai Santa Singh’s own highly melodious creations. The orchestra with special preludes and interludes was of course Ghulam Haider’s. Eight “Shabads” were recorded on four discs of three minutes each and each became very popular. These recordings were made in 1941-42, but their 45RPM extended play discs were available till 1970s. Other Sikh musician whose recordings of Sikh religious music are among the earliest available on records include Bhai Budh Singh Taan, whose rendering of “As Di Vaar” was available on 12 discs in 78RPM. “Asa Di Vaar” by the group of Bhai Sudh Singh Pardhan Singh was also recorded during the forties. One or two records of “Shabad Gayan” in the voices of Bhai Gurmukh Singh Sarmukh Singh Fakkar of Nankana Sahib were also available in the market. In addition one disc of “Shabad Gayan” in the voice of child prodigy Master Madan was also recorded during the nineteen forties. This recording after disappearing from the market for several decades is once again available. Some “Shabads” sung by Bhai Budh Singh Taan and Surinder Kaur were also available in the market during the forties. Bhai Samund Singh, although sang regularly for the radio, but did not record his “Shabad Gayan” on discs until the nineteen sixties, when during the Quin Centennial celebrations of the birth of Guru Nanak a set of five long playing records was published. AFTER the creation of Pakistan, Bhai Samund Singh also joined Bhai Santa Singh in the service of the Golden Temple. They had very different styles of performing “Shabad Kirtan”. Bhai Samund Singh used to perform a modified version of “Khayal Gayaki”. He used to leave the “Alaap”, “Jorh Alaap” and the “Vilambhat Lai” as well as the climax “Dhrut Lai” and sing the entire “Shabad” in “Madh Lai”. On the other hand Bhai Santa Singh either sang in the traditional “Reets” handed down from generation to generation or he created his own “Reets” by improvising new tunes from the source “Ragas” and “Raginis”. Bhai Santa Singh used to rehearse the tunes for hours at a stretch to the accompaniment of “Taan Pura”. Bhai Santa Singh lived a simple life. He used to ride a bicycle on his way to perform “Shabad Kirtan”. One day an admirer presented a car to him, which he retained for a few days before giving it back to him. The reason given for spurning the offer was that he used to recite a path while riding a cycle and he used to complete the path while riding the bike. But when he started being driven in the car the same distance was traveled in 5 minutes and he could not complete the path. Such was the simplicity and lack of greed in Bhai Santa Singh. Once the famous Bhai Chand was supposed to perform last of all in a special “Kirtan Diwan” in pre-partition Lahore and Bhai Santa Singh was the penultimate singer. But Bhai Chand got so much impressed with the “Shabad Gayan” by Bhai Santa Singh, that he requested to skip his own turn and requested Bhai Santa Singh to finish the “Diwan” by singing “Raga Darbari Kanra”. Bhai Santa Singh completely mesmerized the audience with his soulful rendition of “Raga Darbari Kanra”. This story was narrated to me by Bhai Gurdip Singh ji, the head priest of New York’s famous Richmond Hill Gurdwara. Round about in 1949, Bhai Santa Singh abruptly left the service of the SGPC and temporarily moved to New Delhi. Soon he tried his hand at becoming a building contractor in Assam, but contractorship did not suit his temperament and he took employment in Gurdwara Sis Ganj Old Delhi. Delhi was fast becoming a city of refugees from West Pakistan. Some of his most ardent admirers had moved from Lahore, Gujjranwala, Lyallpur, Montgomery, Sialkot and Sheikhupura to Delhi. For them it was a pleasure to listen to the “Shabad Gayan” by Bhai Santa Singh. On hearing about Bhai Santa Singh’s joining the service of Gurdwara Sis Ganj Delhi, the crowds at that historic gurdwara started swelling each morning. The refugee “Sangat” of Delhi got so much hooked to listening to Bhai Santa Singh’s “Shabad Kirtan” at Gurdwara Sis Ganj Chandni Chowk that they insisted that the early morning “Chawnki of Asa Di Vaar” must always be performed by the group of Bhai Santa Singh. The only other group allowed to perform “Asa Di Vaar” in the absence of Bhai Santa Singh was Bhai Avtar Singh Gurcharan Singh and Swaran Singh, formerly of Sultanpur Lodhi in Kapurthala District. While in Delhi Bhai Santa Singh became the staff artist of All India Radio Delhi and his live performance of “Shabad Kirtan” became a regular feature of its Punjabi Program. Some years after 1947, one of the most important members of his group Bhai Surjan Singh parted company and formed his own group. This incident affected him badly, but he trained his brother Bhai Shamsher Singh to sing alongside him. This did not diminish the popularity of his group. In the meanwhile Bhai Surjan Singh’s newly created group also became very popular. To this day the best selling records of “Asa Di Vaar” are Bhai Surjan Singh’s. On the death of India’s First Prime Minister Pandit Jawahar Lal Nehru in 1964, Bhai Santa Singh was the only Sikh religious musician, who was especially invited to perform “Shabad Kirtan” during the period of mourning at All India Radio Delhi. Some of these recordings are still preserved in the archives of the Delhi Station of All India Radio. At one time or the other every great maestro, be it a vocalist or an instrumentalist of India, had the honour of singing at one or the other stations of All India Radio. Some of those artists were recorded and many others were not. Even those who’s performances were recorded, their recordings were destroyed later on due to the callousness of the authorities. If all the recordings of Bhai Santa Singh and Bhai Samund Singh would have been preserved, we would have had at least 300 hours of recordings of each. Such musicians are not born every day. We are sorry to lose their historic moments. Late Yogi Harbhajan Singh was a great admirer of the “Kirtan Shelley” of Bhai Santa Singh. In order to train his followers, the American Sikhs, in the art of performing “Shabad Gayan” he wanted to bring one of the students of Bhai Santa Singh’s school of music to America. Bibi Amarjit Kaur, who had honed her skills under the guidance of Bhai Santa Singh was brought from India to America for the purpose. She now works in the World Bank and lives in Northern Virginia, in one of the suburbs of the American Capital Washington D.C. By listening to her you can get a glimpse of her great mentor. The way she modulates her voice, it appears that she is coming true on the teachings of her great mentor. In 1965, Bhai Santa Singh’s former companion Bhai Surjan Singh suddenly left for his heavenly abode. Although they had parted company years ago, but still Bhai Santa Singh took this loss to heart. For several days he felt very much dejected. But according to the “Gurus” message the life must go on and Bhai Santa Singh did not miss his “Kirtan” schedules. Bhai Santa Singh’s few shabad compositions were used in an All India Radio programme produced in 1969 by Professor Harbhajan Singh, the poet, on the 500th birth anniversary of Guru Nanak Dev. 1. The nearly one-hour long feature, broadcast on the National programme, was written in Hindi as a tribute to Guru Nanak and was part of the year long focus to mark his 500 birth anniversary. The feature was subsequently published in Punjabi as a booklet by M/S Faqir Singh & Sons, Amritsar. 3. I have no idea if Bhai Saheb was specially commissioned (if it was 1969 this couldn't have been possible) to do these recordings or these were excavated from the AIR archives. In case these recordings were taken from the AIR archives, it does indicate that the AIR has possibly a rich collection of Bhai Saheb's renditions. 4. Bulk of the Gurbani rendition in the feature was in the voice of Bhai Santa Singh ji. There were two other raagis and if I am not mistaken, these two were Bhai Avtar Singh and Bhai Amrik Singh. 5. Bhai Sumand Singh ji was not part of the programme. His rendition of "Bhujbal Deejai" is part of the achival material that existed on the spool I had handed over to my painter friend Manjeet Bawa. Bhai Saheb had come to the main Gurudwara in Karol Bagh, New Delhi and had participated in a Kirtan Darbar (attended by many other luminaries). The recording was made by my second cousin and a sound-technician with the AIR, the late Santokh Singh, and subsequently transferred onto our spool. Bhai Santa Singh was in great demand for his unique style of “Shabad Kirtan” all over India, but he seldom stepped out of Delhi. Once in 1966, on the persistent request of the “Sangat” of Bombay he was allowed to go to Bombay for a couple of weeks. On hearing this welcome news, the knowledgeable “Sadh Sangat” of Bombay was electrified. They had the once in a lifetime experience of listening to Bhai Santa Singh live. They requested for more of his time, but the management of Gurdwara Sis Ganj in Delhi refused to extend his stay, because the “Sangat” in Delhi also wanted to listen to his “Shabad Kirtan”. On the day of his departure for Delhi big crowds gave him a tearful sendoff in Bombay. On his way back to Delhi, while still in train, he suffered a massive heart attack. Before any medical care could be administered, he had already left for his heavenly abode, in the feet of his divine master. Bhai Santa Singh’s funeral saw the community in deep mourning. This story was narrated to me by his pupil Bibi Amarjit Kaur. After Bhai Santa Singh’s death, his brother Bhai Shamsher Singh took over his group. Bhai Shamsher Singh could sing in all the tunes of Bhai Santa Singh, but he lacked the range and modulation. After the death of Bhai Shamsher Singh about two decades ago, Bhai Santa Singh’s nephews Bhai Harjit Singh and Bhai Gurdip Singh are keeping his tradition alive. They can not match the dexterity of Bhai Santa Singh, but they have kept all his “Reets” alive. Today they are the leading musicians of Delhi Sikh Gurdwara Management Committee are held in a high esteem. The life may not be perfect but it is, nevertheless, going on.